We took a road trip! I love to travel and go to new places. This trip was a bit new even though I had been to both places before. I’ll start at the beginning. 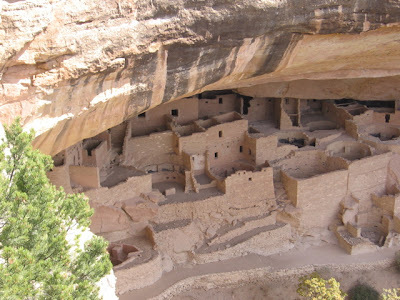 I made reservations months ago to go to Mesa Verde. I changed them three times! Finally it was time to go and I almost changed them again! I dragged Richard away from his work and packed the car. We had to go to the grocery store- the car all packed with 4 kids in tow and already 2 hours late leaving. After getting all our food, we headed to Moab where we planned to stay the night. We drove to Moab with out incident though a little bummed that it was dark as it is a pretty drive. We got there at 10 p.m. and just could not find the hotel. We called and got directions but they did not make sense. We drove all over Moab and called the hotel again. As is turned out, the hotel was in Greenriver, a 40 minute drive back! Goog411 gave us the wrong city and I made a reservation and gave them my credit card! Rich was so bugged! After that 30 minute delay we continued to drive South and found a hotel in Monticello. When we got up the next morning we discovered an empty soda can under one of the beds (we didn’t have any soda). Outside it was beautiful. 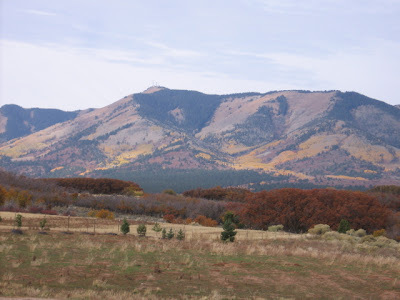 The mountains looked almost cartoonish as their colors were so brilliant. We got a good start and headed to Colorado. Now, I am a good navigator. 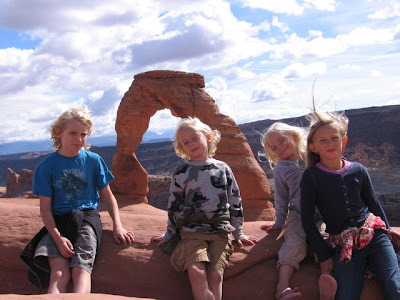 I have taken my kids to lots of places alone, Yosemite, Yellowstone, Arches, and Bryce Canyon to name a few all without incident. I have a map in my glove box and I get hotels and camp all by myself. Me and my 4 kids. What happened next is not normal. Richard was driving which was nice for me as I usually am the driver. He asked me where to go and I gave him the directions from memory. After driving for about 2 hours on a lovely road, I was not seeing any signs that I thought we should have been seeing. I checked the map and almost died! We had been driving 2 hours in a wrong direction. We had been driving South West when we should have been driving South East! Yikes! So I sheepishly told Rich that we needed to turn around... He was bugged again, but not so much as the road was beautiful and we had never been there before and most likely wouldn’t be going on that road again. We did see however, the valley of the gods on HWY 191 near Mexican Hat. 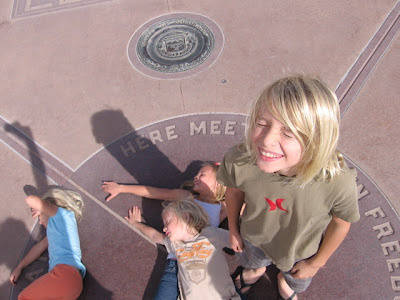 We stopped at Four Corners and were in 4 states at once. It is on a Navajo Reservation and both boys were called girls! 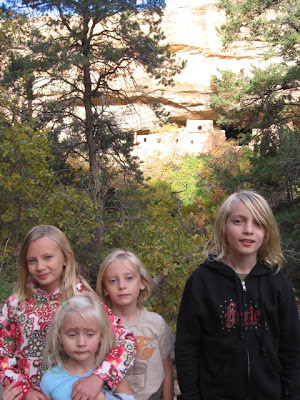 We took a road East and got to Mesa Verde about 2 hours later then I thought we would. We found our tent site and found out that there are bears in the park- much to the excitement of our kids. We visited the Treehouse that evening and saw lots of deer. When we went to sleep we froze. I remembered it very warm the first time we camped there, 11 years ago and in the summer. I did not expect it to be freezing that night in mid October at 7000 feet elevation! It was so cold that it reminded me of the time I camped on the snow when I was in Young Woman’s and we went on some pre-camp hike and camp in Idlywild and lost the trail because of the unexpected snow. It was miserable that night- though just for Richard and me. Our kids, though cold were in heaven. Atlas almost cried when we told him we were going to stay the next night in the lodge! Because we saw so many does, the kids started putting money on bucks, bears, wolverines, and turkeys. Unfortunately no one got any money as there were only a ton of female deer! We had a fun day hiking and climbing in Cliff Palace. I don’t remember all the ladders from the first time we went, and if I had, I don’t think that I would have taken all the kids down to see the ruins. When we were listening to the Ranger tell about the site before we started in, we could see people climbing on the face of a cliff, exiting. I thought that it was a different ruin, not the one we were going to see. Down in the site Emilia realized that there was only one way out- not the way we entered. The both of us were a bit panicked. I am not fond of heights, especially with a three year old! And ladders on the face of a cliff did not sound fun. It still doesn’t, but it wasn’t so bad! We ended up not staying in the lodge. 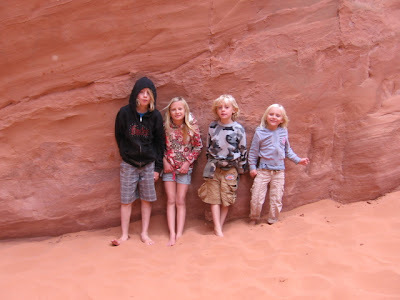 We decided to go to Moab that night instead. But before we left the Park, I connected with a mangy coyote. A car in front of us was stopped. In Yellowstone that would mean an animal sighting, but at Mesa Verde, it meant road construction. Not this time. A very large coyote was standing by the side of the road. As the car in front moved on, we stopped by the large canine. I called out to him (called him a her) in my cooing animal talk. He walked closer. All the kids got so excited and started talking to the coyote and rolled down the windows- hanging out to get a better look. I panicked a bit and told them to get back in the car- with my window down I kept talking and keeping eye contact with him. I really wanted to give him our leftover turkey burger sitting in our cooler. Rich almost did, but then we thought that it might be a conspiracy and a ranger was watching us and would give us a $500 fine for feeding a wild animal. We started to drive off, with the window down, and the coyote followed us. 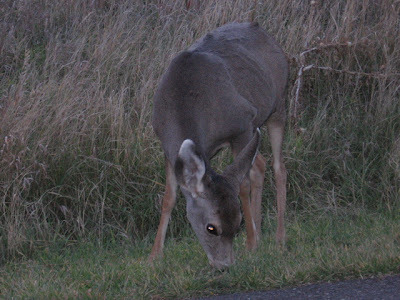 We stopped and reconsidered feeding him, but ultimately left. I think that I left a part of my heart with that sad, beautiful, mangy coyote. We made it to Moab in record time, considering our little detour previously. On the drive there we were always on the look-out for birds. Leif thinks he saw a bald eagle though he also swears that he saw a wolverine back in Mesa Verde! At one time Richard spotted a volture- Atlas said it was a golden eagle and I didn’t see it. I saw a goshawk- a few, on the tops of telephone poles. Richard thought one looked like a grouse and Atlas thought they all were falcones! I think that we need to go to bird school. We got to pick any hotel we wanted downtown when we reached Moab! 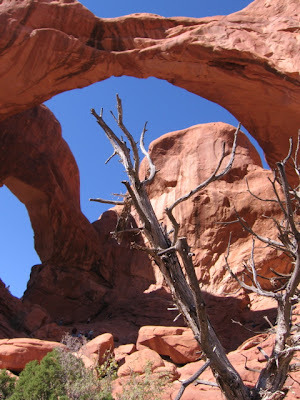 Arches was amazing as usual. During one of the hikes, Atlas grabbed my hand and told me he was glad we came and that it had been better then he had hoped! The kids swam in the pool and warmed up in the hot tub and played in the sand. It was great. On the way home, at a Paris pee stop, Rich found a recently killed owl. It looked like it had hit someone’s windshield. He wrapped it in a plastic bag and put it in our trunk! It is now laying on our recycling bin getting wet in the rain and hail! All in all the trip was great- it was different then other trips I have taken with the kids. Different dynamics with Rich present. Usually Atlas sits in the front seat and talks to me, but he was moved to the rear to be a kid. There were great times and there were hellish times with the kids in the car. At one point I threatened to pull out all their hair if they didn’t stop fighting and touching each other! Not a hair was harmed by the time we got home but they only got mush for dinner! Wow, sounds like an awesome trip! 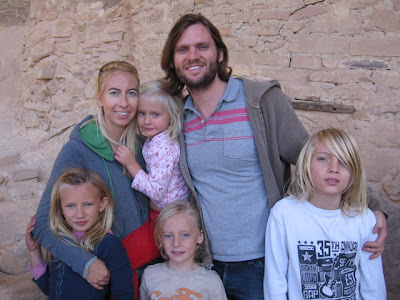 I can't get over how gorgeous your family is... and i love the photo of the coyote. 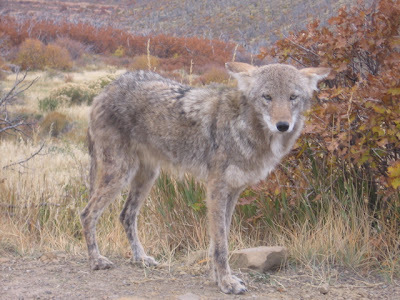 do you remember hearing the coyotes howl at night in fallbrook? i sure do. i miss you and i *love* reading your blog! That coyote! What a great photo. Why are all of your kids mini-Bridget clones? P.S. I'm serious...? So, you can see that I'm not afraid that one of them will over throw me...I just want them with me! I miss you too...both of you! I can't believe that photo of the coyote was real. That is such an amazing shot and you should send it to a magazine. It's neat that you go about every year bc I still remember photos of a previous trip there. When the kids are older it will be neat to see the difference through the years. Atlas is such a sweetheart and all the kids are so beautiful. What a great family trip. Reminds me of some of the stuff we did growing up. PS. remember when me and Charla would sing that sea pony song and one night we sang and the coyotes started howling? That was so funny. "call upon the sea ponies when you're in distress. . "
Seriously you should totally send that coyote photo into National Geographic's photo competition. Send photos of your kids into gap.com for that most adorable kids competition. p.s. that was me and peter. Vacations with kids always seem like a mix of great good and terrible. The great memories always seem to last the longest and make you glad you went.